The air travel tax was approved in 2010 in a national solo effort and introduced on January 1, 2011. The aim of the tax was to raise an additional €1 billion annually for the federal budget in order to contribute to the consolidation of the budget. The air travel tax is imposed on flights departing from German airports. The amount depends on the distance to the destination country and is between €7.46 and €41.97 per passenger. The tax has to be paid by the respective airline. In most competitive countries, no comparable tax exists. 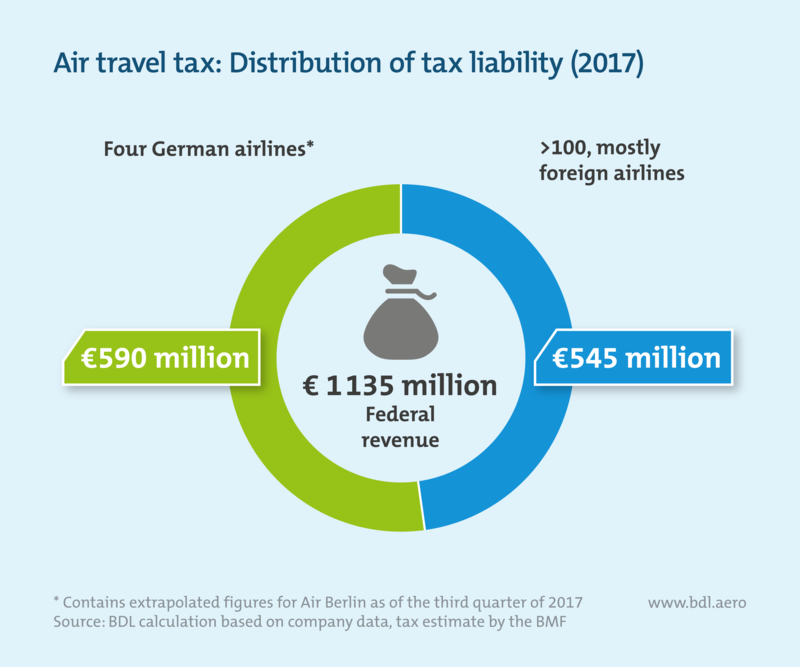 The air travel tax weakens the German aviation companies because they are burdened disproportionately: in 2017, the federal government collected €1,135 million in air travel tax. Of this, four BDL member companies had to shoulder more than half, around €590 million. Foreign competitors, on the other hand, are only slightly affected by the tax, as only a small fraction of their business is based on departures from German airports: the remainder of the tax burden is distributed among more than 100 other airlines, mostly foreign ones. Due to intense international competition, companies are only able to pass on a limited proportion of the tax to passengers in the form of higher ticket prices. A large part of the tax therefore has to be settled from the operating result by the airlines themselves. The inequity for German enterprises was not only demonstrated in a regular evaluation by the BDL but also in an evaluation by the Federal Ministry of Finance. The consequences of this distortion of competition are serious: while Germany is at the forefront of economic growth in Europe, it has been at the bottom of the rankings for years in terms of air traffic growth. The strongest growth is evident in air traffic markets where there are no taxes on tickets or taxes have been reduced. Since the introduction of the air travel tax, business migration effects can be observed, especially at the western border: German airports that are located close to the border have only grown by 10 percent since 2011, while airports in neighboring countries have grown by 63 percent. The German hub airports are growing only half as fast as their competitors in other European countries. The remaining growth at German airports is mainly driven by foreign competitors. 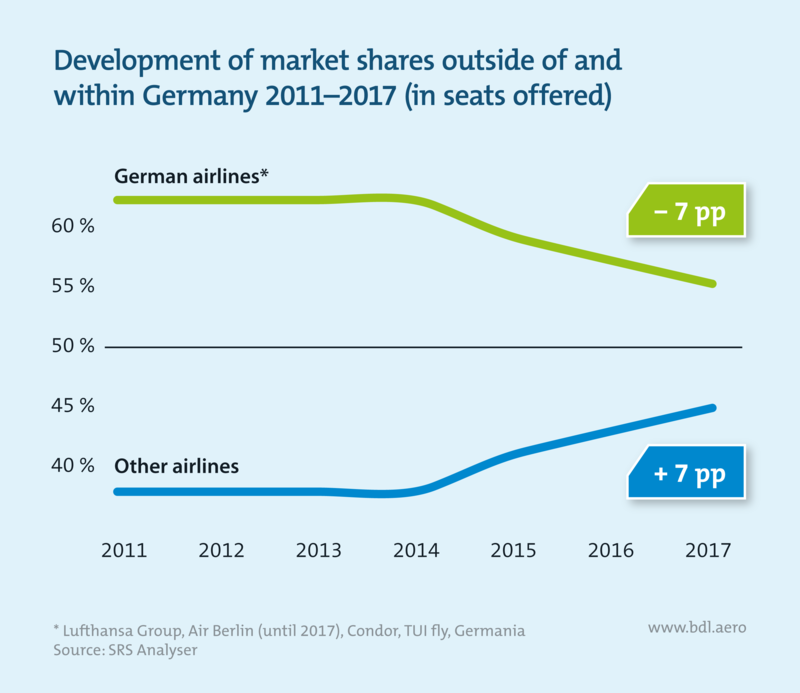 German companies, on the other hand, have been suffering losses in market share for years: since 2011, the market share of German airlines at domestic airports has fallen by seven percentage points. This development can be attributed not only to the air travel tax but to a whole range of extraordinary charges. 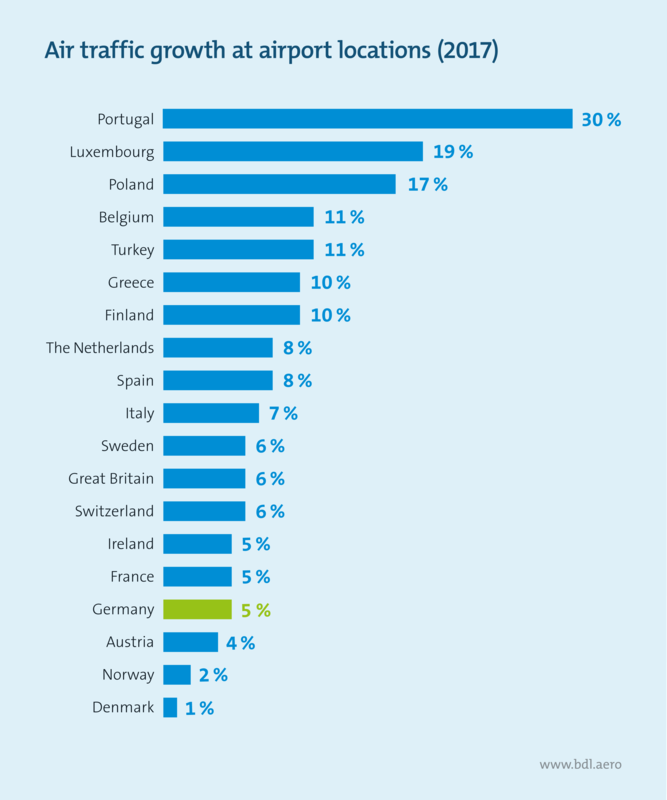 However, the air travel tax represents the largest additional fiscal burden in Germany. The air travel tax weakens not only the competitiveness of German aviation but also its investment power. The tax deprives companies of financial resources that could otherwise be invested in quieter and more energy-efficient aircraft. With the €3.8 billion that German airlines paid to the tax authorities between 2011 and 2017, 45 aircraft of the particularly economical and quiet Airbus A320neo could have been purchased to replace older aircraft. This tax burden blocks further progress toward quieter and more energy-efficient aircraft. What would be the benefit of abolishing the aviation tax? The air travel tax was approved in 2010 against the background of a deficit in the federal budget. Since then, the budgetary situation has eased markedly: in the last three years alone, there has been a surplus in the federal budget of €23 billion. The argument with which the tax was introduced is therefore no longer valid. But there are also other important reasons why the air travel tax should be abolished. 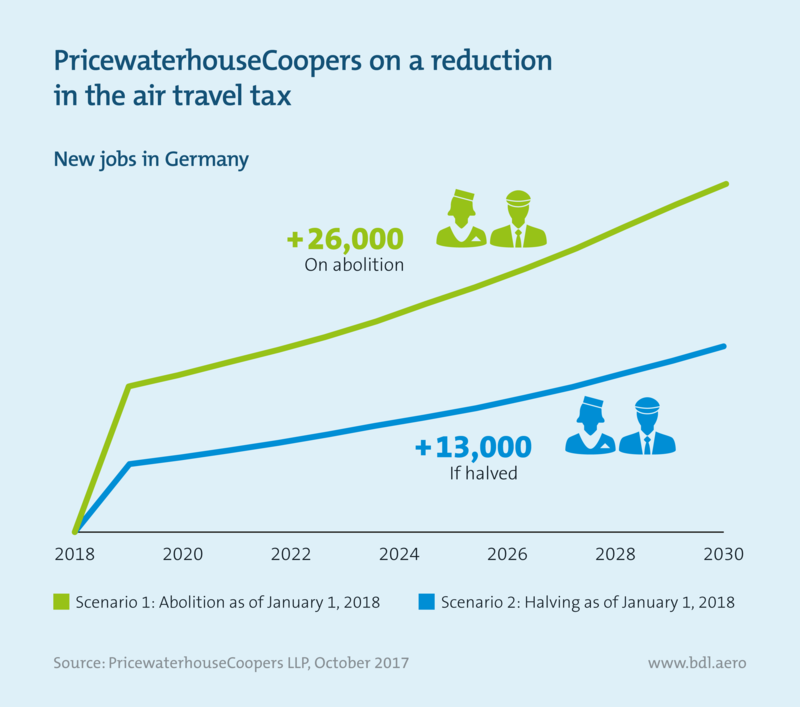 A study by PricewaterhouseCoopers looked at what the consequences for the German economy would be if government were to abolish or at least halve the air travel tax. An abolition of the air travel tax would, firstly, reduce the distortion of competition to the detriment of German airlines and strengthen the investment power of German airlines and airports. Secondly, the abolition of the tax would also stimulate demand. If government were to abolish the tax completely, 12,300 new jobs would be created in Germany in the first two years after the abolition. By 2030, this figure would rise to a total of 26,000. If government did not abolish the tax but halved it, like Austria did, at least 13,000 new jobs would be created in Germany by 2030. The predicted employment effects do not simply take into account the development of air traffic but also consider the development of the German economy as a whole.